No life-threatening injuries after bus and semi collide in west Sask. 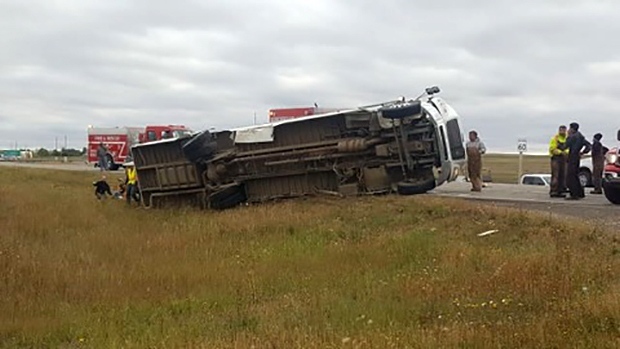 A bus and a semi collided near Kerrobert, Sask. on Sept. 14, 2018. RCMP is currently on scene of a crash between a bus and a semi-truck near Kerrobert. The crash happened before 6 p.m. at the intersections of Highway 21, 31 and 51 on the northwest edge of Kerrobert. Police say there were 16 people on the bus. Ten people were taken to hospital in Kerrobert with undetermined injuries. Three of those people were then taken to hospital in Saskatoon. Police say none of the injuries are life-threatening. The cause of the crash is currently under investigation, police expect the highway will be closed until at least 2 a.m. on Saturday. Kerrobert is about 185 kilometres west of Saskatoon.